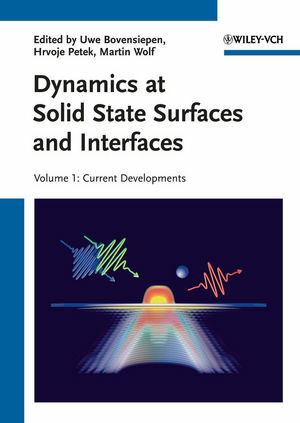 This two-volume work covers ultrafast structural and electronic dynamics of elementary processes at solid surfaces and interfaces, presenting the current status of photoinduced processes. Providing valuable introductory information for newcomers to this booming field of research, it investigates concepts and experiments, femtosecond and attosecond time-resolved methods, as well as frequency domain techniques. The whole is rounded off by a look at future developments. Uwe Bovensiepen received his Ph.D. degree in physics in 2000 from the Freie Universität Berlin (FUB), Germany, for his experimental work on phase transitions in ultrathin ferromagnetic film systems. In 2000, he worked as a postdoc at the Fritz-Haber Institute, where he started femtosecond time-resolved experiments at interfaces. In 2001 he moved to the FUB, where he set up a femtosecond laboratory to investigate ultrafast dynamics in solids and at interfaces in the group of Martin Wolf. He received his habilitation in 2005 and was supported by a Heisenberg fellowship of the DFG afterwards. In 2009, he was appointed as a full professor at the University of Duisburg-Essen. Hrvoje Petek obtained his B.S. and Ph.D. degrees in Chemistry at the MIT and at the University of California at Berkeley in 1980 and 1985. From 1985 he was a Postdoctoral Fellow and Research Associate at the Institute for Molecular Science. In 1993, he became a Group Leader at the Hitachi Advanced Research Laboratory, where he set up first femtosecond time-resolved photoemission experiments in Japan. In 2000, he was appointed Professor of Physics at the University of Pittsburgh, where he is also the Co-Director of the Petersen Institute for NanoScience and Engineering. Professor Petek is Editor-in-Chief of the journal Progress in Surface Science. Martin Wolf received his Ph.D. degree in physics in 1991 from the FUB, Germany, for his work on photochemistry at metal surfaces performed under the direction of Gerhard Ertl. After a postdoctoral period in Austin, Texas, with Mike White, and at IBM Yorktown Heights, with Tony Heinz, he set up a laboratory for femtosecond surface spectroscopy at the Fritz-Haber-Institute, Berlin. In 2000, he was appointed as a full professor for experimental physics at the FUB and in 2008 as a director at the Fritz-Haber-Institute.